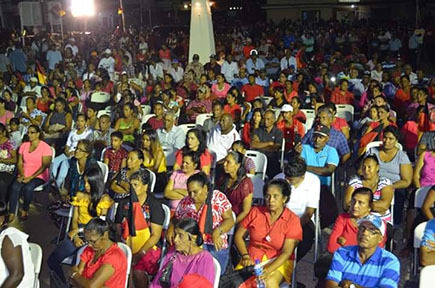 The People’s Progressive Party/Civic (PPP/C) over the weekend attracted hundreds at public meetings held at Corriverton and Rose Hall Town, Corentyne, where Opposition Leader Bharrat Jagdeo continued to use the ongoing campaign for local government elections to criticise the APNU+AFC’s governance of the country. Jagdeo, who has said the upcoming municipal and neighbourhood polls are a dress rehearsal for the 2020 general elections, told the roughly three hundred persons gathered at Rose Hall Town Arch on Sunday evening that they have a very powerful tool in their hands, which was fought for by many generations of people—the right to vote. “I say to you do not take lightly this power that you have in your hands. We expect you on November 12th to exercise that power. It is our way of fighting back against this government that has inflicted so much pain on our nation in such a short period of time,” he said. He stated, that supporters of his party in the sugar and rice belt areas, who were “fooled” by the promises made in 2015 by A Partnership for National Unity (APNU) and Alliance For Change (AFC), have returned to the PPP/C. “Many people who left us in the sugar belt—because a lot of our people from the sugar and the rice belt believe the promises and left us—they are back home now and we should welcome them and we should welcome anybody whether they are PNC people all their lives into our party, that is how Cheddi Jagan operated,” he added. Jagdeo warned residents against believing the promises made by the government and he used the about-turn on the closure of sugar estates to make his case. “They broke every single promise,” he said. “Zero increase for three years. You know that you have not had a salary increase for three years. They abolished the API [Annual Production Incentive], which was there for 70 years. Four estates gone, 7,000 people out of a job and you will believe them when they say they want to keep the three remaining estates? You can’t believe a single word of this government. They have demonstrated over and over how untrustworthy they are,” he added. According to Jagdeo, while many may think that they are safe because the Albion Estate is still functioning, the decision by the government to ignore the recommendations of its own Commission of Inquiry against closing estates is instructive. “When they say the three other estates are safe [and] don’t worry about that, they are consolidating sugar, they can never be trusted,” he added. He told the gathering, which included Albion Estate workers, that GuySuCo is now a “shell company…After they close the four estates, they took all the assets, the buildings, the land, etc., of the four closed estates and transferred them to SPU-NICIL… and they left all of the liabilities for GuySuCo. They then took 100% of the shares of the three remaining estates and transferred it to SPU-NICIL. So SPU NICIL now has all the assets, it owns the estates, everything, and what does old GuySuCo have here at Albion? It has the pension liabilities, it has severance liabilities, it has all the old debts, [and] it has the liabilities to GRA and the NIS. They have stripped the assets of old GuySuCo, so you are working for GuySuCo now but GuySuCo doesn’t own the company,” he said. Additionally, he pointed out that funds are not being spent to improve GuySuCo and that instead NICIL has been using the money to build a swimming pool and lounge at the LBI Estate. Jagdeo also once again criticised how government has handled severance payments to the laid off workers, saying that they were denied full payments that they were legally entitled to. “…And then suddenly [President David] Granger comes to a rally and suddenly he says look how good I am, I will give you your severance now and we must all be grateful to him because he is gonna pay the severance just before the elections”, he said. Jagdeo maintained that the estates did not have to be closed, while saying that his former government did not only view the sugar industry as being simply about profitability. “We said look at sugar in a multi-functional way, sugar is not just about how much money you make but look at the employment it generates, look at the linkages to other sectors for every sugar worker, or every two sugar worker that you employ. Their salary employs another person, whether it is a vendor or someone else, their linkages are great. Secondly, the sugar workers were contributing to GRA. Seven thousand of them now will not be contributing to GRA any longer. They were contributing to NIS, the NIS now collapsed because 30,000, not just the 7,000 sugar workers, 30,000 people lost their jobs, so NIS would have less income,” he asserted, before also mentioning the critical roles GuySuCo has played in drainage and irrigation as well as in foreign currency earnings. Meanwhile, Mayor of Rose Hall Vijai Ramoo told the gathering that the town is being sustained with little or no help from central government. “They have not given Rose Hall a single cent. We have run this town with no help from central government. I have no apology for that,” he said. Ramoo told the people of his township that he will be no pushover to any government officials. “I can assure the people of Rose Hall [that] once I am here, there will be no tax increase… I do not have time with that. Once I am there, no pen ain’t signing no document. We gon struggle and we gon do we thing and come 12th of November we gon show them,” he added. The crowd at the Corriverton meeting was more than double the one at Rose Hall. 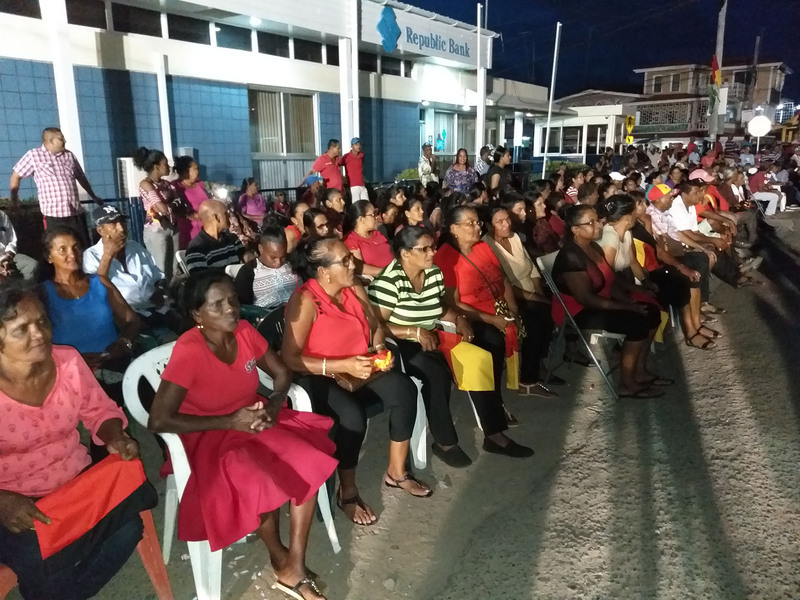 The PPP/C also attracted large gatherings at its community meetings on the East Bank Berbice, Canje, Fyrish, Whim and other areas throughout Region Six.